Brittney English poses with two campers and their SeaPerch underwater robot at the Campus Recreation Center pool. As a toddler Brittney English would duck walk under her father’s car and watch in fascination as he changed the oil. 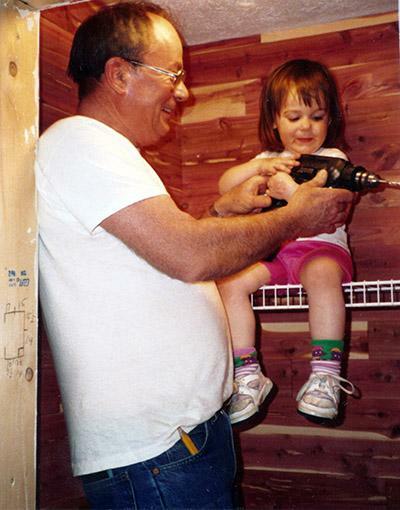 The first time she held a power drill was at the age of three under the tutelage of her grandfather as he built a set of bookshelves. A few years later, she began squirreling away nuts and bolts, saving them in a jar like precious treasure. The electrical and computer engineering doctoral student describes herself as an “outgoing, audacious, and curious” kid who was never dissuaded by challenges or gender stereotypes. “I had a catch phrase when I was little. It was: ‘Excuse me, I’m a professional,’” English said. Her father, a fighter pilot for the U.S. Air Force, and her mother, a stay-at-home mom, embraced the inquisitive nature of their daughter. “They didn’t really have a choice. I wasn’t the type to take ‘no’ for an answer,” English said. English’s curiosity blossomed into a love for math and science and eventually led her to study engineering. She earned her bachelor’s degree in computer engineering from the Georgia Institute of Technology’s School of Electrical and Computer Engineering in 2011. From 2011 to 2013, she worked as an engineer for the Department of the Navy and simultaneously received her master’s degree in electrical and computer engineering from the University of Florida. She is currently working toward her Ph.D. degree here at Georgia Tech with a focus on robotics. English realizes her upbringing was pretty exceptional. Many girls aren’t encouraged to tinker with tools. And when it comes to preconceived notions about what kinds of subjects should appeal to girls versus boys, even the boldest of girls can get bogged down by stereotypes. “It’s hard to be a woman in tech, but we change it by prevailing and encouraging others to prevail,” English said. One way she does just that is her outreach work with women here at Georgia Tech. She has served as a graduate teaching assistant and mentor for the Opportunity Research Scholars (ORS) program, which offers undergraduates hands-on work in research, and as a graduate student coordinator for the Summer Undergraduate Research in Engineering/Sciences (S.U.R.E. ), a program designed to attract underrepresented minority and women students into graduate school in the fields of engineering and science. There is a lot of pressure on females in electrical and computer engineering, because there are fewer of them. English is keenly aware of a double standard and she strives to never put her mentees into positions for which they aren’t prepared. “Women who come out of Georgia Tech with electrical and computer engineering degrees are top notch, because in some ways, they are expected to fail. For every white male who isn’t so good, there are 10 more who are amazing and people will look past it. Because there are so few women in the STEM workforce, if there is a woman who isn’t prepared for the job–that translates to all women. It’s not fair, but it happens. I encourage the women I mentor to be phenomenal professionals and squash biases while there are so few of us. I’d rather not give anyone a reason to doubt our abilities by working that much harder and being that much better,” English said. 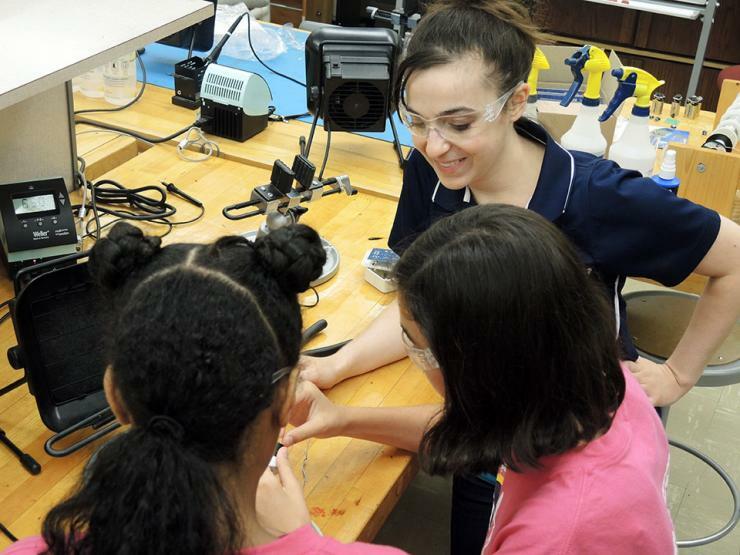 This past June, English had the opportunity to influence a new generation of female engineers through the Women in Engineering (WIE) Technology, Engineering, and Computing (TEC) Camp for rising seventh and eighth grade girls. She developed a curriculum for the week that introduced the girls to robotics in a unique way. One of the most popular means to introduce kids to robotics utilizes LEGO MINDSTORMS® technology to teach how to build and program a robot. While the LEGO program provides a great hands-on experience, English went a step further. She wanted to give the girls a project that introduced them to some of the skills she was lucky enough to learn from her father and grandfather. 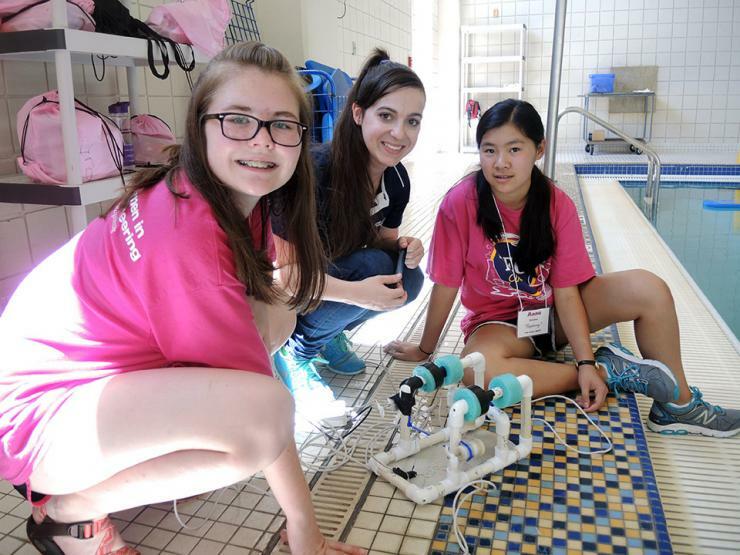 She opted for a week-long project called SeaPerch which allowed the campers to experience the full spectrum of building a remote-controlled underwater robot. Starting with using power tools to cut and drill PVC pipe for the Remotely Operated Vehicle’s (ROV) frame, they then moved to soldering and waterproofing electronic control boxes and motors. The last day of camp was spent at the Campus Recreation Center pool to test drive their creations. The project exposed the girls to a variety of principles and applications which spanned across physics, math, and engineering. “I choose the SeaPerch project because each module gave the students a chance to develop a new skill. Some of the girls had never even held a drill. By the end of the week, not only had they assembled a robot from scratch, they also created the internal workings that made it move,” English said. The SeaPerch project has a personal connection for English as well. As a full-time employee of the Department of the Navy from 2011 to 2013, she worked with underwater robots that detected mines in the sea. English credits her own outreach experiences with where she is today. Growing up she took advantage of every opportunity, even applying to a highly competitive internship program with the Air Force Research Laboratory in Florida as a high school junior. The program only accepted college students, but English was undeterred. They wanted a resume. English didn’t have any job experience, so she wrote a one-page overview of what she wanted to accomplish. It was enough to get English an interview and eventually the internship itself. She was the lone high school student interning that summer. She ended up coming back for the next three summers. Her first exposure to robotics was during her third summer. She was on the pyrocopter team where she researched controlled burns with a remote-controlled helicopter. It was dramatic, exciting research and it kicked off her love for robotics. Her relationship with the Air Force Research Laboratory led to her becoming a recipient of the Science, Mathematics And Research for Transformation (SMART) Scholarship for Service Program between 2009 and 2011 and an Air Force Research Laboratory intern from 2007 to 2010. English spent summers interning with the Department of the Air Force working on robots for remote bomb disposal, controlled burns, and fighter pilot training systems. Since that experience, English has explored robotics by sea, air, and land and has seen how robotics can be a powerful entry point for getting girls engaged in engineering. Even more impactful can be early encouragement to tinker, build, and fix things. “If you want to keep engineering open as an option for your daughter, encourage them to help out with things like fixing the car and using power tools. It’s these special and highly personal experiences that can spark an initial interest in a young girl. Even if they don’t go into engineering—they had the exposure and someone who told them ‘if you want it, you can do it,’” English said. Brittney English coaches TEC campers on soldering in an ECE lab. Brittney English and Technology, Engineering, and Computing (TEC) Camp participants. Brittney English at the age of three with grandfather Bob English. They are installing shelves in the closet in his basement. 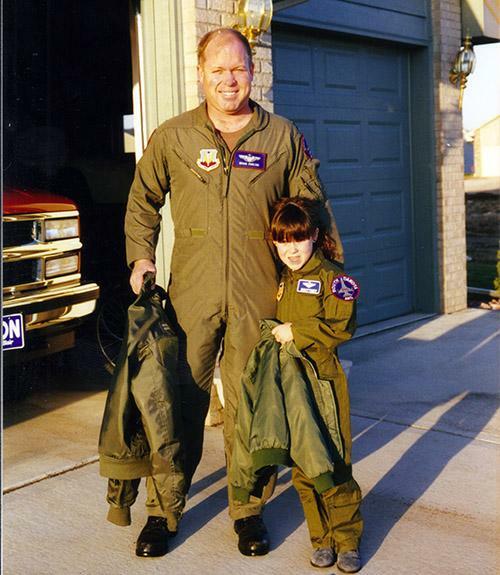 Brittney English and her father Brian English pose in their matching flight suits and jackets prior to "Take Your Daughter To Work Day."